James Louis Fregosi (April 4, 1942 – February 14, 2014) was an American professional baseball shortstop and manager, who played in Major League Baseball (MLB) from 1961 to 1978, primarily for the Los Angeles / California Angels. He would later move on to the New York Mets, Texas Rangers, and Pittsburgh Pirates. 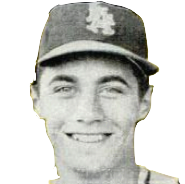 Having been the Angels’ most productive and popular player for that franchise’s first eleven years of play, Fregosi quickly became its first star. He led the American League (AL) in defensive double plays twice, winning the 1967 Gold Glove Award, and, upon leaving the team, ranked ninth in AL history, with 818 double plays. Fregosi holds the franchise record with 70 career triples; several of his other team records, including career games (1,429), hits (1,408), doubles (219), runs (691), and runs batted in (546), were broken by Brian Downing over the course of the 1986 through 1989 seasons. Fregosi returned to the team as manager, guiding it to its first-ever postseason appearance in 1979, and later managed the Philadelphia Phillies to the 1993 National League pennant. In February, 2014, Fregosi suffered a stroke while on a MLB alumni cruise. He was taken to a hospital in Florida for treatment, where he was put on life support. Subsequently, after having suffered multiple additional strokes in the hospital, Fregosi was removed from life support and died a few hours later. At the time of his death, he was the top advance scout for the Atlanta Braves. Sidelined by several injuries including a broken thumb in 1972, Fregosi struggled with the Mets, where he played mainly at third base, and was sold to the Texas Rangers in the 1973 mid-season. After five years as a backup for the Rangers (1973–77), during which he played primarily as a first baseman, he was sent to the Pittsburgh Pirates in June 1977. When the Angels expressed interest in naming him as their manager in 1978, the Pirates released him to pursue the opportunity. In his 18-year career, Fregosi batted .265 with 1726 hits, 151 home runs, 844 runs, 706 RBI, 264 doubles, 78 triples, and 76 stolen bases in 1902 games played. In addition to the Angels records previously noted, Brian Downing also broke his club marks for career at bats (5244), total bases (2112) and extra base hits (404). Don Baylor broke his team record of 115 home runs in 1981. Fregosi was the last player to retire who was a member of the "original" Los Angeles Angels. Jim Fregosi's number 11 was retired by the Anaheim Angels in 1998. In becoming the Angels' manager at age 36, Fregosi was presented with a solid team nucleus of Ryan, Baylor, Downing, Bobby Grich, Carney Lansford, Frank Tanana and longtime owner Gene Autry, compiling a record of 62-55 in 117 games, and tying for second with Texas behind the Kansas City Royals. In 1979, with the addition of Rod Carew, he led the Angels to an 88-74 record, surprising the Royals and winning the first title in the club's 19-year existence. But they didn't have enough to get by the Baltimore Orioles in the 1979 American League Championship Series, losing Game 1 in 10 innings and dropping a 9-8 slugfest in Game 2; the Angels captured a 4-3 win in Game 3, scoring twice in the bottom of the ninth on an error and a Larry Harlow double, but were knocked out in an 8-0 Game 4 loss. After Ryan's departure to the Houston Astros at the end of the season, the team's pitching faltered in 1980, and the club dropped back into sixth place in their division; Fregosi was replaced in the first half of the 1981 season. Fregosi's record was 237 wins and 248 losses in the regular season and one win and three losses in the post-season. From the Angels, Fregosi was brought back into the game by Cardinals Farm Director Lee Thomas to manage the Louisville Redbirds of the American Association for three seasons. Louisville won the league championship in Fregosi's first season in 1983, and lost the league championship in the playoffs. In Fregosi's second season, Louisville tied for fourth place in the regular season but won the 1984 league championship. In 1985 Fregosi's Louisville team finished the season in first place and won the league championship in the playoffs also. With his success in Louisville, Fregosi was hired to manage the Chicago White Sox in 1986. Fregosi managed the team for three seasons, in each of which the White Sox finished in fifth place in the American League West. Fregosi was released at the end of the 1988 season. Fregosi finished with a record of 193 wins and 226 losses in the regular season. He didn't manage any post-season games for the White Sox. Fregosi returned in 1991 with the Phillies, hired again by former Angels teammate and General Manager Lee Thomas. His greatest triumph as a manager came in 1993, when he managed the club to the World Series. After finishing 26 games out of first place in 1992, the 1993 Phillies (featuring a cast of colorful characters including Darren Daulton, Lenny Dykstra, Dave Hollins, John Kruk, Danny Jackson, Curt Schilling, and Mitch Williams) charged to 97 wins and then further shocked the baseball world by pulling off a major upset against the two-time defending NL Champion Atlanta Braves in six games in the League Championship Series. Despite putting up a good fight against the defending World Champion Toronto Blue Jays in the World Series, Fregosi's Phillies wound up losing to Toronto in six games, with Joe Carter's Series-winning home run in Game 6 being the final blow. Despite the World Series run, Fregosi was often the target of criticism by the Philadelphia sports media. One general criticism of Fregosi was that he was a manager who relied on veteran players and was unable to develop younger players. He was ultimately fired by the Phillies in 1996 after posting a series of dismal post-1993 seasons. Fregosi finished with a record of 431 wins and 463 losses in the regular season and six wins and six losses in the post-season. Fregosi was hired away from the San Francisco Giants (where he had been serving as a special assistant) as the new manager for the Blue Jays in 1999, and was replaced after the 2000 season despite the fact that the team finished in third place and above .500 in each of his two years in Toronto. Fregosi finished with a record of 167 wins and 157 losses in the regular season. This ended up being his final managerial position in Major League Baseball. This was the only team where he finished above .500 winning percentage. As a manager, he had a record of 1028 wins and 1094 losses in 15 seasons. He also managed 16 post-season games. His post-season record was seven wins and nine losses. At the end of 2004, when the Phillies were looking for a manager to replace Larry Bowa, Fregosi surfaced as a candidate for the job. The job ended up going to Charlie Manuel. Fregosi's number 11 was retired by the Angels in 1998. Fregosi delivered a eulogy at the March 2007 funeral of longtime friend and former Phillies coach John Vukovich. In February 2014, Fregosi was a part of an MLB Alumni cruise when he suffered multiple strokes. The cruise docked in the Cayman Islands where he was rushed to a local hospital, where his condition was stabilized by doctors before he was relocated to Miami. However, on February 13, Fregosi's condition declined and he died the following day. Phillies owner David Montgomery called Fregosi a "dear friend" after his death. ^ Bowman, Mark (2007-10-18). "Notes: Holliday no surprise to Johnson". Retrieved 2007-10-23. ^ a b c d e f g h i j k "Jim Fregosi". Baseball Reference. Sports Reference LLC. Retrieved December 16, 2014. ^ Salisbury, Jim (2007-03-14). "Baseball bids 'Vuke' farewell". The Philadelphia Inquirer. ^ Simon, Andrew (2014-02-13). "Fregosi critical following multiple strokes". mlb.com. Retrieved 2014-02-13. ^ Ringolsby, Tracy (February 14, 2014). "Six-time All-Star and former manager Jim Fregosi dies at age 71". MLB.com: News. Retrieved February 14, 2014. Armour, Mark. "Jim Fregosi". SABR.